Astronomy Center, Gift Shop, Hayrides, Picnic facilities, Tours, Trails, and more. Fishing, Gift Shop, Hayrides, Historical Buildings, Picnic facilities, Playground, Trails and more. Gift Shop, Group Tours, Hiking Trails, Environmental Awareness Center, Wildlife Viewing Area and more. Boat and Canoe Launch, Fishing, Hunting, Picnic Facilities, Trails and more. Concessions, Clubhouse, Disc Golf, Fishing, Fitness Trail, Paddle boats, Picnic Facilities, Playground, Softball, Swimming and more. Fishing, Open Play Fields, Picnic Facilities, Playground, Recreational Equipment Rental, Swimming, Trails and more. Basketball, Cross Country Ski Rental (Dec-March/snow-permitting), 72 Hole Championship Disc Golf, Fishing, Food Concessions in Summer, Hayrides, Off Lease Dog Facility, Open Play Field, Picnic Facilities, Playground, Recreational Equipment Rental, Sand Volleyball, Soccer Field, Softball Diamonds, Tennis Courts, Trails and more. Along with its signature landmarks and public beach access, Marquette Park offers sand dunes, two lagoons, an oak savanna that dates back more than 2,000 years, and Patterson Island -- areas popular with hikers, birdwatchers, fishermen, and photographers. Cross Country Ski Rental (Dec-Feb), Fishing, hayrides, Open Play Fields, Picnic Facilities, Recreational Equipment Rental, Trail Head of Oak Savannah Trail and more. Fishing, Jon Boat and Trolling Motor Rentals (seasonally), Open Play Fields, Paddleboat Rentals (seasonally), Picnic Facilities, Trail and more. The Tolleston Dunes Trail follows 10,000 year-old sand dunes that were formed when Lake Michigan was 25 feet higher than in recent years. Tolleston is the second youngest of four distinct dune systems found within the national lakeshore. Together these dune ridges provide a glimpse into the changing shoreline of Lake Michigan. You can hike the trail year-round, cross-country ski when snow permits, or walk to the accessible overlook point that has interpretive wayside exhibits. Wolf Lake Memorial Park is home to boating, kayaking, fishing, windsurfing and a full host of outdoor recreational activities. Visitors enjoy the Pavilion at Wolf Lake and the Aquatic Center, which are linked to the Hammond Marina and area amenities by way of a pedestrian trail. Welcome to Friendship Botanic Gardens, where forested woodlands, sprawling open spaces, and cultivated gardens spill over 100 acres of land that have been a tourist destination since 1936. Gardens are tucked throughout the beautiful valley of Trail Creek. Located on 89 acres just south of LaPorte, Luhr Park features four ecosystems: upland forest, wetland, prairie and stocked pond (fishing pole rental available at the Nature Center), paved trails, picnic shelter rental, picnic tables, restrooms, fishing pier, playground, boardwalks, observation tower, and a No-Leash Dog Exercise Area. There is also a geocache located in the park. Michigan City Campground is a privately owned family campground. It is nestled on 40 acres just 5 miles from Lake Michigan and open year round. We also have many monthly sites available with winter water, as well as seasonal and overnight spots. Michigan City Campground is a great place for fun and family gatherings. The Pinhook Trail System features two very different habitats. The Upland Trail highlights a rich beech and maple forest growing on top of a glacial moraine formed about 15,000 years ago. The Bog Trail leads to a bog in a depression in the moraine created when a large piece of ice broke off the melting glacier. The bog features an incredible habitat with unique plants. This 33-acre park site is located in the southwestern part of the city, along U.S. 6, just east of County Line Road. Countryside Park features a playground, sledding hill, picnic shelter, softball field, and a fishing pond. The park also has access to the Prairie Duneland Trail which passes along the southern boundary of the park. Countryside park is most recognized as the home of the Portage Historical Society and the Alton Goin Historical Museum. The museum along with the restored structures of the Traeger Homestead create a farm-like setting for visitors to enjoy. The bridge offers the only designated public access to the Kankakee River in Porter County, allowing fishermen and paddlers to launch their boat here and enjoy the beautify natural surroundings. Those who enjoy fishing can cast fro walleye, bass, crappie, bluegill and Northern Pike, among others. At 276 acres, Imagination Glen is the largest park in the City of Portage . Located along the eastern boundary of the city, between State Road 149 and McCool Road, Imagination Glen is home to the Park Department’s softball and soccer complexes, two sand volleyball courts, a BMX race track, and the 10-mile Outback Mountain Bike Trail. The park also contains a large nature preserve, two playgrounds, picnic shelters, open play space, access to fishing on Salt Creek and is bordered to the south by the Iron Horse Trail. 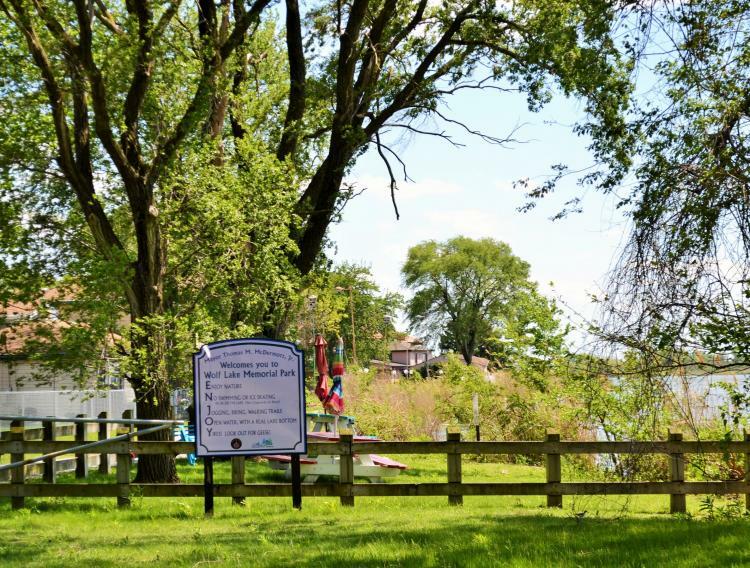 This 64 acre park is the center of the City of Portage Park System. Woodland Park houses the Parks Department administrative offices, a community center featuring banquet halls, a multi-purpose gymnasium and access to the Iron Horse Trail. This picturesque wooded park is also home to Woodland Park Preschool, the Veteran’s Memorial, a playground, a skate park, a gazebo, picnic shelters, a sledding hill, an Oak Savanna habitat, the community garden and a dog park.